The purpose of this text is twofold: to provide the Canadian engineering profession with a reference text on legal issues and principles of relevance to practising engineers; and to prepare candidates for Canada’s professional practice engineering law examinations. The professional practice examination is now a prerequisite in many provinces and territories for licensure of Professional Engineers. 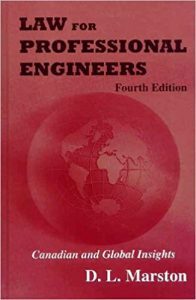 Consistent with the purpose of the professional practice examinations, the focus of this text is to provide helpful insights into areas of the law of particular relevance to engineers in practice. This fourth edition has been prepared to update particular aspects of the law that have seen significant change through legislation or court decisions since the third edition in 1996.